I decided to set up Coach2K.com to share with people what I've learned playing the game of NBA2K basketball. I grew up in the state of Indiana which used to be considered basketball country. I played organized basketball from about fifth grade through high school and then recreationally until I turned 35 years old. Then I retired. While I was a starter on my high school varsity basketball team, it was a small school so I can't say that I was awesome by any means (I was actually a better baseball player as I once struck out 20 guys in one game). However, if you watched the movie Hoosiers, I can tell you that I grew up playing in gyms just like those here in Indiana. As time went by, I developed a pretty good three point shot and have been told that I was the greatest flat footed three point shooter they ever saw. Well, I doubt it but it was a fun compliment. The only sad part about that fact is that when I played high school ball, they didn't even have the three point line back then. I have been watching NBA basketball since the late 70's and am a big Indiana Pacers fan. I was a season ticket holder for a while and have experienced my share of fan frustration. But I also got to see some of the best playoff memories in Pacers (and NBA) history including being in the building to see all three NBA Finals games in 2000 versus the Shaq and Kobe Lakers! 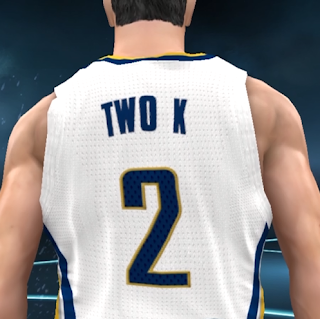 I love the game of basketball and even though the Pacers weren't the greatest team when I started playing NBA2K, I chose to use them because I live in Indianapolis and I am a true fan of the team. It's rare that I use any other team than the Indiana Pacers in NBA2K. Eventually, I learned so much about my NBA2K Pacers that I was able to learn how to win with them against the best hall of fame level CPU teams in NBA2K. I have game footage of me playing NBA2K on YouTube!. Here's a link to a great video of me beating the HOF CPU 76ers! On Coach2K.com, I do my best to show you how to play the game of NBA2K the way I think it should be played and hope that my site helps you improve your game. I am also always open to playing against my readers. I try and play anyone who wants to play me at least once. If you want to try and get a game in with me, I only play on 12 minute quarters, hall of fame difficulty and simulation sliders. You can learn more about playing me online by reading this article I wrote called How to Play Coach2K. I believe in playing in a no rules, no quitting, open play style approach. I also believe in being a good sport whether I win or lose. Although I'm decent, I'm not the greatest NBA2K player in the world. In fact, you are probably better than me. I'm exclusive to the Playstation. My PSN ID is www-Coach2K-com. Feel free to friend me if you'd like too. If you do friend me on the Playstation, include a message about how you found me so I know your request isn't spam.